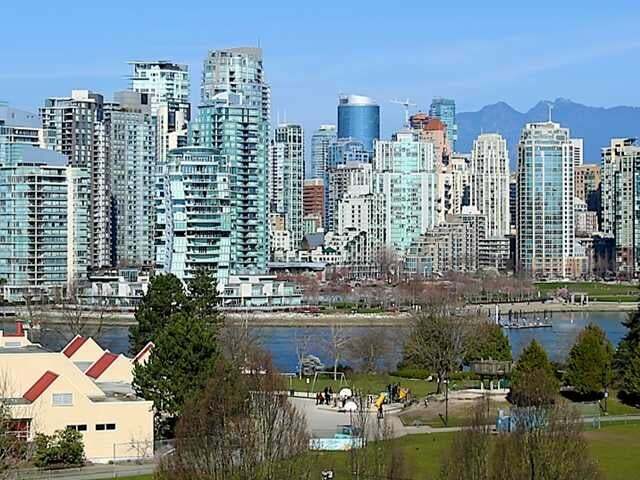 FANTASTIC FAIRVIEW SLOPES TOWNHOUSE with UNOBSTRUCTED views over FALSE CREEK & NORTH SHORE MOUNTAINS. Modern end unit with loads of natural light, corner windows, skylights & many upgrades. Enjoy the view from your kitchen, granite countertops, S/S appliances, counter top stove & windows over sink. H/W floors thru-out main level, gas f/p w/ thermostat control in livrm, modern 4pc bath w/heated floors & 2nd bdrm used as a home theatre w/ 7 invisible B/I speakers in the walls. Intercom w/TV screen for security. FULL ON VIEW w/sliding glass door walk out to deck from living room. Master bdrm has large walk-in closet, 4 pc ensuite with cork floors. Large foyer with closet. Well maintained boutique building. 2 car pkng.